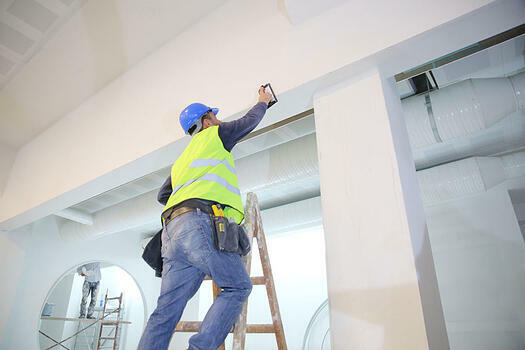 Painters apply paint, stain and coatings to walls and ceilings, buildings, bridges and other structures. Painting requires a lot of climbing, bending, kneeling and reaching. Most industrial painters work outside, almost always in dry, warm weather. Those who paint bridges or buildings may be exposed to extreme heights and uncomfortable positions. Drywall finishers hang wallboard and install ceiling tile inside buildings. The work is physically demanding. Workers spend most of the day standing, bending, or reaching, and they often must lift and maneuver heavy, oversized wallboards. Glaziers, painters and finishers may experience cuts from tools and glass, and falls from ladders and scaffolding. Most glaziers, painters and finishers work full time. Painters, glaziers and drywall finishers learn their trade through a registered apprenticeship program that is usually cost free to the student. A high-school diploma or equivalent is typically required to begin your apprenticeship and career in the trade. After the apprenticeship and based on certifications, a journeyperson painter (a qualified and skilled person in a trade), can earn between $20.00 and $30.00 per hour. Employment of painters is projected to grow 7% from 2014 to 2024, about as fast as the average for all occupations. Overall job prospects should be good and opportunities for industrial painters and coaters are expected to be excellent, especially in the Gulf Coast region. Learn more about a career as a PAINTER!